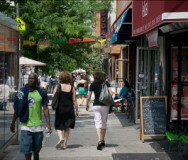 In a separate article, New York also named Prospect Heights one of the ten neighborhoods on its "Where to Live in 2014" list. Jonathan Butler of Brownstoner suggests, "stick to streets not directly affected by Atlantic Yards." To which one might ask: "Which ones are those?"